The Story of god with Morgan Freeman is an American documentary series written for television and featuring the American Academy Award-winning actor Morgan Freeman. In the series Freeman goes on to explore different cultures and religions in order to learn more about how religion-related topics, like the belief in God, are perceived by different communities. 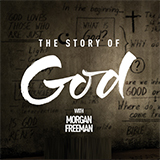 The Story of God with Morgan Freeman was produced for the National Geographic Channel in cooperation with Freeman's own production company, Revelations Entertainment. On his journeys the actor explores themes like why evil exists in the world, what exists beyond death, and who God is. To do so he travels all over the world, from California to India to Egypt. Season 1 Episode 5 - Why Does Evil Exist? Season 1 Episode 4 - Who Is God?